"Wanted to tell you all how much I enjoyed Vipassana this evening. What an amazing effort you've all put into this labor of love, and it shows. Thank you for making my evening perfectly delightful... complete with music and dancing! 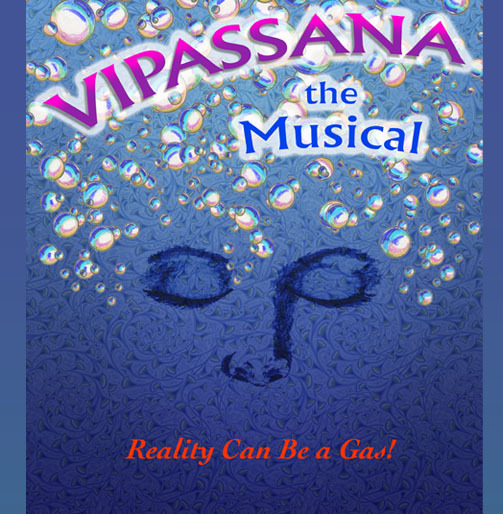 "Vipassana - the Musical" from Miso Tunks on Vimeo. The play had its World Premiere at the historic Star Hall, Moab, UT on Feb. 4, 2011, and ran Feb. 5, 11, 12, 13, 18, 19. Subsequent productions are in the works. Dates and locations to be announced. Vipassana (Vih-PAHS-ah-nah) is a 2500-year-old silent meditation technique designed to erradicate human suffering. The story takes place at a 10-day Vipassana silent meditation course. Funny, sad, provocative and unpredictable, this high-energy play follows the playful and soul-baring story of one woman's journey on the path toward self-discovery. From cynical shennanigans and righteous rebellion, her path winds its way through a spiritual break-down centered on a mysterious visitor, leading finally to an epiphany. Her story is interwoven with the individual trials, tribulations, and triumphs of the other students at this "boot camp" of meditation, all told through dialogue, song, dance and musical performance. Prepare to be enlightened and entertained. ©2010 OKOKOK Productions. All rights reserved.